This is without doubt a celebration cake!! 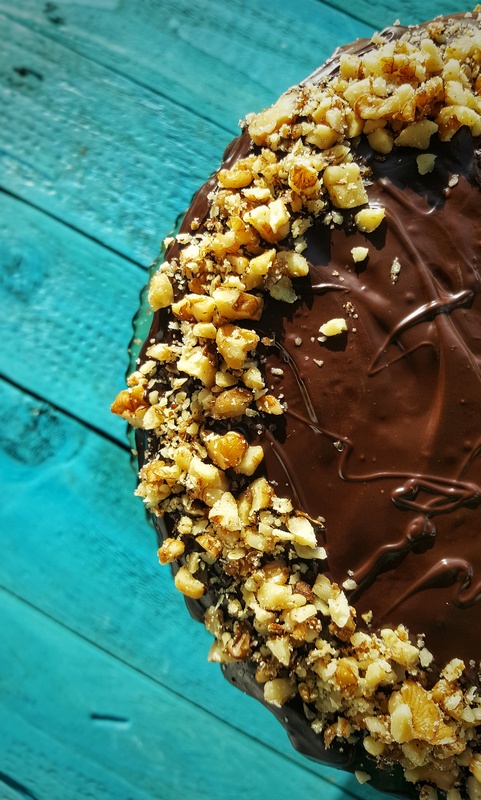 My take on a classic Coffee and Walnut Layer Cake is not for every day consumption and likewise all cake, sweets, chocolate and crisps shouldn’t be the main focus of our daily plates as advised by the national dietary guidelines in Ireland. In my opinion, my Mam makes the best coffee cake imaginable and for the blog’s fourth birthday I decided to create this cake. I have switched up my Mam’s tried and tested recipe a little by adding some walnuts to the cake batter and going slightly over the top in terms of the decorating. For a simpler version, simply exclude the nuts, bake in one tin and serve with a spread of the buttercream filling on top or bake the batter in two tins and creating a sandwich with the filling. The addition of the filling on the outside and the chocolate drizzle are again if you want to make your version look incredibly fancy! Any type of a madeira or sponge cake freeze really well, either freeze the completed version whole or cut into portions. You could also freeze the cakes once cooled, then defrost and complete the filling stages. Preheat an oven to 180°C/160°C fan/350°F. Grease and line 3 x 6 inch round cake tins. Beat the butter and sugar together with a stand mixer or electric whisk until it forms a light and fluffy mixture. Sieve the flour and baking powder together in a bowl. With the mixer running on a medium speed, add 2 tablespoons of the flour mix and wait until fully combined. Add 1 egg and wait until fully combined. Continue with the flour and egg pattern until all the flour is added. Turn off the mixer and stir through the coffee essence and walnuts by hand with a spatula or wooden spoon. Divide the mixture between the three prepared tins and smooth off the tops. Bake in the oven for 18 minutes or until golden brown and a skewer comes out clean. Allow to cool in the tins for 5 minutes before turning out onto a wire rack and allowing to cool fully. For the buttercream filling: using a stand mixer or electric whisk beat all the ingredients together until smooth. Spread a third of the mix on the top of two cakes and stack the cakes one top of the other. Leave the cake with no icing on top at the top. Spread the remainder of the icing around the cakes and lightly on top of the third cake. Melt the chocolate in a heat proof bowl over a simmering pot of water. Allow to cool for a couple of minutes (if the chocolate is too hot, the icing will melt!!). Remove the cake from the fridge and pour over the chocolate starting in the centre of the cake. Gently spread the chocolate out so that it drips down the sides. Press the chopped walnuts around the base of the cake and on the outer rim of the top.